My column widths are all over the place and I want to make it look more presentable. 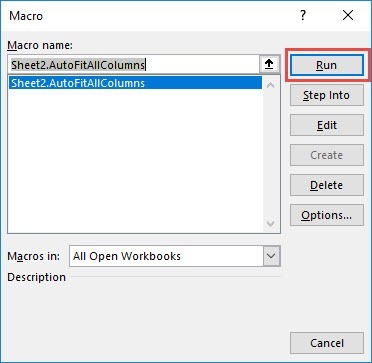 Did you know you can autofit columns using Macros in Excel? And with this cool trick, it can be done in just one click! I explain how you can do this below step by step! STEP 2: Make sure Sheet2 is selected as we want to autofit the columns there. Paste in your code and Select Save. Close the window afterwards. STEP 3: Let us test it out! Make sure your macro is selected. Click Run. With just one click, all of the columns are automatically fitted now!